In October 1932 a voluntary association was formed consisting of representatives from a number of local organizations including the Native Sons and Daughters of the Golden West, the Daughters of the American Revolution, the Public Library, the Santa Barbara Mission among others. The Articles of Association laid out the purposes of this new group: to foster research and study of the history of the city and county of Santa Barbara; to collect, preserve and make available materials having to do with that history, and to provide for exhibition of such materials. This new association was named the Santa Barbara Historical Society. Shortly after its founding, the Society was offered the tower room in the Santa Barbara County Courthouse as an exhibition space, described by one observer as “at the apex of a dark and winding staircase” and the Society began to collect, catalogue, and store artifacts and documents. The tower room was supposed to be temporary, but the expansion and needs of county government (imagine a growing government bureaucracy – shocking!) constantly trumped the needs of the Historical Society. As collections grew, items were stored at the Courthouse, the public library, people’s homes, and later at the Museum of Art. And so things stood for the first decade of the Society’s existence. In 1942, the Society moved to establish classes of membership, admit individuals, and set up a schedule of dues. This resulted in a considerable increase in membership and in the accelerated acquisition of materials for collections. The next step was taken the following year when on June 7, 1943, the Santa Barbara Historical Society became a California non-profit corporation. And, in 1945, if you wanted to become a member of this newly minted corporation it would set you back a buck a year. Or you could splurge and join at the highest membership level – 25 bucks. The Society’s growth necessitated a larger space than the courthouse tower room. Katherine Bagg Hastings offered her home, the Trussell-Winchester Adobe at 412 West Montecito Street as a new headquarters. The adobe would ultimately be turned over to the Society in 1955 after Mrs. Hastings death. Various plans were put forward during the course of the 1940s about building a museum facility at West Montecito, but lack of funding was a major stumbling block. During World War II, the tower room was lost to the Society; it became an air raid observation post. The search for a permanent home continued into the 1950s. Early in the decade the Society opened negotiations with the Franciscans at the Santa Barbara Mission regarding use of a portion of the mission cloister for office and exhibition space. Once approval was gained from the Vatican, a license agreement was signed in January 1954 for 10 years at $10.00 per year. For that the Society got five rooms, 1500 sq. feet. The first exhibit was held in the new quarters in May. In 1955, the Society hosted some 10,000 museum visitors; this compared to a few hundred while the Society called the tower room home. The Society would remain housed in the Old Mission for the next eleven years. After a few years, however, it became ever clearer that, once the ten-year agreement with the Mission came to an end, the Society would have to vacate the premises. Where to go? What to do? The West Montecito Street location was not the answer. Eyes turned to a downtown location – this location. This site, El Recinto Stanwood, named in honor of long time supervisor and Fiesta El Presidente, Sam Stanwood, had long been earmarked for a museum. Negotiations were opened and spanned the years 1959-61. 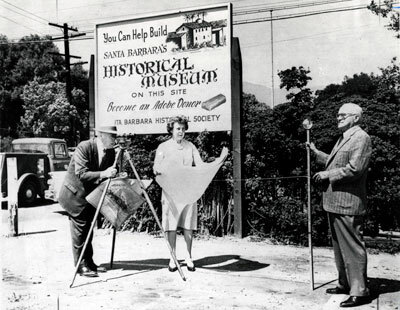 In March 1962 Santa Barbara County granted a 99-year lease to the Society and a building fund campaign was launched with a goal of $350,000. Ultimately the cost would run close to half a million. In 1963 ground was broken for the adobe museum building – 25,000 square feet of exhibition, office, and collections storage space, built with some 70,000 adobe bricks. Thirty-two Douglas fir timbers were used, each weighing just under one ton. On February 25, 1965, the building was dedicated. The Santa Barbara Historical Society, today the Santa Barbara Historical Museum, long a vagabond orphan, had come home.